Spending on home improvement products in the U.S. hit $303 billion last year, so it’s clearly a major topic on homeowners’ minds. 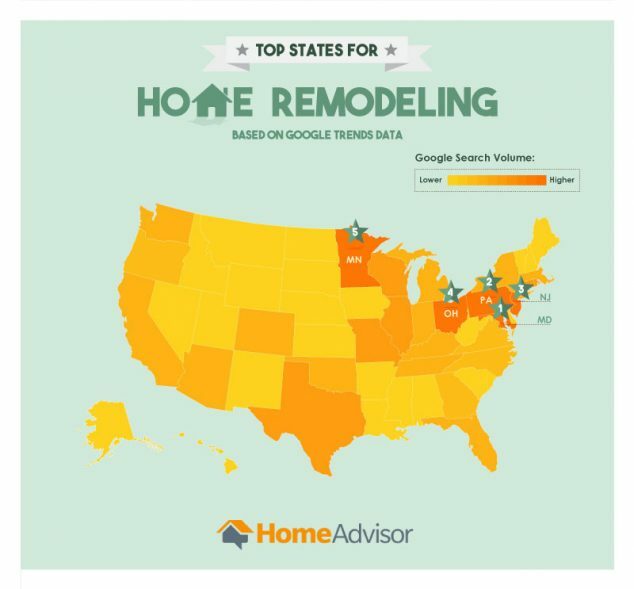 But to get a better look at just what kind of renovations are being made across America (and who cares the most about these renovations), we used Google Trends and HomeAdvisor data to map the country’s home improvement priorities. States in and around the mid-Atlantic region demonstrated the highest concentration of home improvement-related interest; in fact, mid-Atlantic states nabbed three of the top-five spots. A clear trend of lower search interest occurs in northwestern states until you get to Washington and Oregon, where search volume increases once again. Consumers in the more populated coastal states show a high level of interest as well. With a better understanding of which areas experience highest levels of home improvement-related search traffic, here’s a look at the renovations and upgrades that these states are most curious about. Service inquiries tend to group together into regional patterns. States in the Rocky Mountain and Great Plains region, for example, may have fewer searches, but they’re home to a large concentration of roofing service inquiries. Heating services and snow removal services are a major concern for the cold Northeast states, and lawn services are a hot topic for Iowa, Missouri, and Michigan. Since home improvement needs vary by area, it’s important to find a service professional that is qualified in the jobs relevant to your specific demands. The research also shows needs in specific product categories by state. In the flooring category, southern states still prefer traditional, durable flooring options such as stone and tile. But for cooler, less humid locations, carpeting or natural wood are a common choice. Synthetic grass installation was also a major task according to statistics this year — particularly in California — increasing nearly 500% because of the five-year drought. Additionally, because additions and remodeling inquiries account for a significant portion of searches, a review of the data with those services excluded is warranted. Cleaning and maid services prevail, followed by a strong demand for roofing. Even still, unique scenarios do exist. Wyoming is the only state where window services are more requested than any other type. Plenty of states also enter the plumbing and handyman services classifications: two categories that otherwise appear to be in lower demand. Interest in specific home improvement projects varies greatly from one part of the country to another. External factors, such as weather and regional trends, play a central role in determining which types of services the local population will be searching for. Regardless of your personal home improvement desires, it’s always important to locate and take advantage of the working knowledge of professionals in a given industry. Their insight and experience can help ease the process and make improving your home a much more enjoyable experience. Hi-Just curious—trying to find out date of this infographic–for ex. on top of chart which is top states for home remodeling, info sourced is Google Trends & Home Advisor—but I don’t see any reference to date of when this infographic was done. Your help is much appreciated. Hi Sheryl – it was created in early 2015.